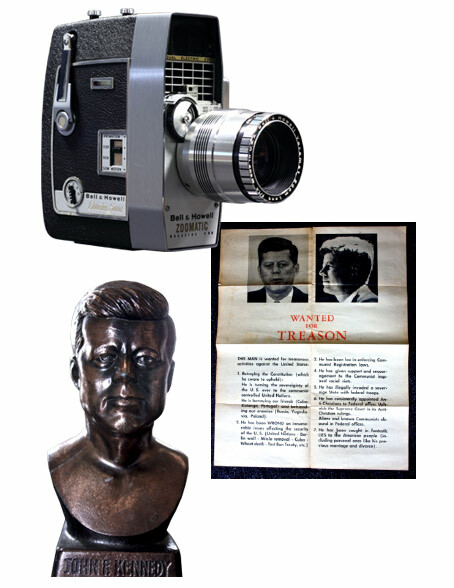 Abraham Zapruder’s 8mm footage of the Kennedy assassination is an extraordinary example of 20th century citizen journalism and an iconic cultural document that has been central to our emotional connection with and our understanding of the events in Dealey Plaza on 22nd November 1963. Restricted access to copies of the film and Life magazine’s error in printing still frames from the home movie out of sequence has fuelled conspiracy theories and debate for decades. With the release of digital, high definition images one would think that every frame has now been scrutinised by researchers to the point where there is nothing left to learn from the material. However, an extraordinary alignment of factors converged around Abraham Zapruder on that day in Dallas. These synchronicities have enabled us to convert the 8mm footage into convincing stereoscopic 3D without computer manipulation. The vantage point Zapruder secured, above the heads of the crowd and set back from the road, the speed and direction of the camera’s pan from left to right, the timing of the shots, the speed of the motorcade itself enables us to translate adjacent frames from the movie into a parallax view of events that mirrors the way our eyes process images of the world. Ironically, Zapruder himself, observing events through the camera’s viewfinder, with one eye tightly closed, would not himself have seen the assassination in 3D. I feel it is finally time to present 63|3D for exhibition." I was involved in the post punk music scene, making slide projections for a band. It was all very lo-fi, no budget and small scale but I got to meet some interesting people; Throbbing Gristle, Crass, Factory, Alan Moore and Z’ev, and got exposed to some fascinating ideas about society and culture. So, in 1982, when I decided to start making films, it was with the intention of exploring that same territory through the moving image. In the middle of all this was a reel of 8mm film – the Zapruder footage. An unauthorised copy I believe, that was made during the time of the Warren Commission investigation into the assassination. My first intent was to recreate the obsessional private cinema screenings that appeared in JG Ballard’s The Atrocity Exhibition. I’d written to Ballard a few times before about his work; now I wrote to him as a first time film maker asking if he’d be interested in collaborating. Naïve I know, but I believe one should always start at the top. Of course, he wasn’t interested but he was gracious in his refusal. I couldn’t leave it alone though. I began my search for what I felt was the pivotal document, the keystone that would hold the whole idea together and maybe even convince Ballard that it was worth taking a punt on the project; Abraham Zapruder’s 30 second film of the assassination of John F Kennedy. This was pre-internet. I was on the dole in a Midlands town. Yet, after maybe a year of intermittent research and a lot of reading I traced my first 8mm copy to a collector in the US. I couldn’t afford the price he was asking. A few months later I had the great fortune to begin corresponding with US journalist Penn Jones. Penn was waiting for Kennedy to give his speech at the Dallas Trade Mart when news came through of the assassination. Penn was supportive of my interest, generous with his time, answering the many questions I asked him even though he’d probably answered them so many times before. I’d voiced my interest in obtaining a copy of the Zapruder film and asked if he could find me a copy. 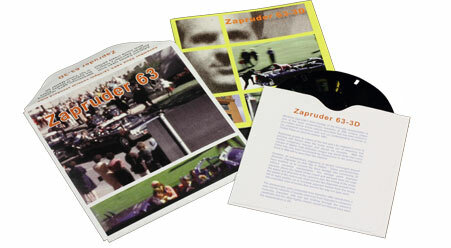 One day a massive parcel appeared on my doorstep filled with magazines about Kennedy, about the witnesses at Dealey Plaza on that fateful day and the catalogue of their obituaries. In the middle of all this was a reel of 8mm film – the Zapruder footage. An unauthorised copy I believe, that was made during the time of the Warren Commission investigation into the assassination. In 1984, thanks to Penn Jones, I believe I was the first person in the UK to screen the assassination footage to the general public. Alan Moore was there. I’d put the idea of Ballard’s Atrocity Exhibition to one side, as the repeated viewings of the assassination opened up a whole series of questions about the man who’d made the film and triggered a new obsession. How was it that this footage remained so clear? When so many others had run at the sound of the shots, what made Zapruder stand so still, keep focus, track the action and capture this invaluable evidence of Kennedy’s death? The fascination remains with me. Many years later I obtained a copy of Zapruder’s witness statement. He describes what was going through his mind as events unfolded. Clearly he was distanced from the action by the act of watching it through the viewfinder; making it seem unreal, a mediated event. He talks about the moment when the first shot rang out and the president clutched his chest, believing this to be a joke on Kennedy’s part; pretending to be shot. Then comes the headshot. I believe from this moment on Zapruder is in a state of shock, lens glued to the passage of the presidential limousine as it disappears from view with Jackie kneeling on the trunk of the moving car (To retrieve fragments of her husband’s skull? To Escape? To help Secret Service Agent Clint Hill climb aboard?). He talks about the moment when the first shot rang out and the president clutched his chest, believing this to be a joke on Kennedy’s part; pretending to be shot. I’d collected viewmaster reels, stereoscopic viewers, odd photographic equipment for years, so during my early viewings of the 8mm footage it was not a great leap of imagination for me to realise the way Zapruder had panned with the action offered an opportunity to realise the scene in 3D. I proposed the idea first in 1985, attempting it by making slides of adjacent frames. I was not happy with the results. In 2002 I attempted it again as an anaglyph moving image piece. Still not happy with it. Finally, I feel that affordable 3D moving image technology has caught up with my aspiration for the piece, and with the 50th anniversary of the Kennedy assassination upon us I feel it is finally time to present 63|3D for exhibition. My intent in presenting these images in 3D is a tangled weave of many conflicting feelings and thoughts. There’s a compulsion to it that cannot be fully explained. The original impetus to replicate Ballard’s portrait of obsession in The Atrocity Exhibition remains, as does the cold technological challenge to prove that 3D rendering may be possible, but mixed with this is an inexplicable urge to reclaim these images, to strip them of the status of cultural icons, as if they were just another string of Warhol repetitions, and reinstate their power as shocking first hand witness evidence. 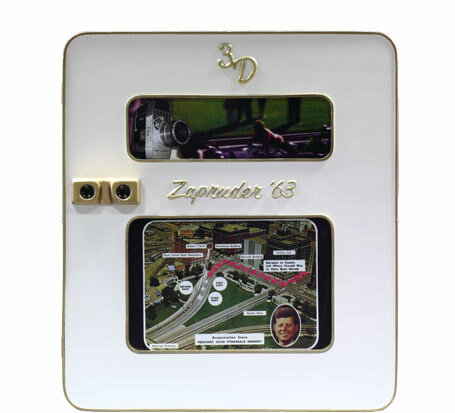 I feel the need to somehow to place us in Zapruder’s shoes, to witness events as he witnessed them, to feel what he felt and to see ourselves, equipped as we are with mobile devices that permanently connect us to the world, as potential future citizen journalists. The Arab Spring, the murder of Lee Rigby, the death of Ian Tomlinson; all reveal our contemporary role in documenting events, upholding justice and holding the systems of justice and government to account when things go wrong. Reconditioned and repurposed 1960s Stereoscopic 3D arcade viewer, mounted with 40 stereo image pairs. Coin operated – triggered by old British three-penny piece. Visitors each given 1 x 3d coin to operate machine. A clearly marked viewing area for audiences – this should correlate to Zapruder’s position in front of the grassy knoll in relationship to the presidential motorcade. Zapruder’s 8mm camera on tripod or plinth in viewing space (Optional). MP3 audio files: ambient soundscape created from Dallas Motorcycle Police Radio communications, news reports, Kennedy’s speeches. These contextual objects can be provided for display within the exhibition space in a series of wall-mounted cabinets or floor-standing vitrines (not supplied). Scale model of the presidential limousine complete with figures of JFK and Jackie Kennedy, senator Connelly etc. A Portrait in Red: 12″ vinyl record featuring Lee Harvey Oswald interviews. Viewmaster style reels for sale at the exhibition. Reels in packs with booklet specifically branded with your gallery or festival logo. Limited edition presentation gift sets branded with festival or gallery logo complete with vintage View-master. Threshold Studios is a creative media and visual arts organisation working with new and emerging technologies; specialising in the production of digital, moving image and public realm works. Working across the arts and creative media industries, the public sector, grassroots communities and higher education, Threshold brokers, supports and delivers digital arts and media projects to drive Creative Media for Social Change. They work with a range of partners to broker solutions towards employability, skills and sector development agendas, as well as supporting arts organisations with the development of their digital strategies.